On the southern shore of Santa Cruz is Puerta Ayora, which is also its biggest town. Though its biggest town, Puerta Ayora has only just over 12,000 residents; which speaks to the remoteness of most parts on the island. The downtown is a charming and walkable area with all the amenities of a tourist town: hotels, restaurants, gift shops, and night clubs. A short walk from downtown brings the traveler to Tortuga Bay. This bay is as untouched as a beach can get, with rules against swimming in the water and disturbing wildlife. 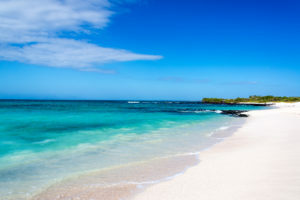 The beach ranges from clear-blue water washing onto white sand to groupings of black volcanic rock from previous eruptions by the local volcanoes. Along the shore, the traveler will be able to catch sight of tortoises, iguanas, pelicans, and other species of bird. Given that the island has no natural predators, the wildlife isn’t skittish of people. Also in Puerto Ayora, and on Academy bay, is the Charles Darwin Research Station. This research station is dedicated to the preservation of Galápagos ecosystems. The station is open to the public and has different exhibitions for the traveler to see. 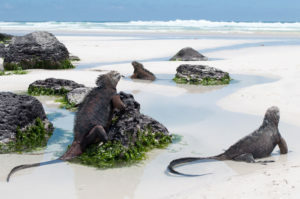 Working closely with the Charles Darwin Research Station, the Galápagos National Park service is also responsible for the conservation of the biodiversity found throughout the Galápagos. The national park covers almost 97% of the land that make up the Galápagos Islands. 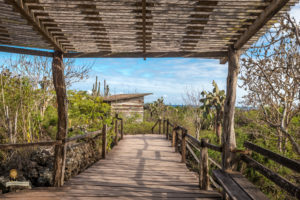 In central-western Santa Cruz, the El Chato Tortoise Reserve is dedicated to conserving the slow-moving and peaceful Galápagos Giant tortoises. This reserve is also home to many species of bird and the ancient scalesia tree. Other unique sites to the island are the lava tunnels, where hollow tunnels that were once filled with lava are now explorable by the traveler. These tunnels are part of an expansive network of underground tunnels found all around the island of Santa Cruz. For the traveler who loves to explore underwater treasures, Gordon Rocks is an opportunity to see sharks, sea turtles, eels, rays, and seals. Even with all of these features, these don’t even scratch the surface of Santa Cruz. The Galápagos Archipelago is a legendary area of this planet that helped bridge the link in the timeline of Earth’s evolutionary process. Santa Cruz is an important and welcoming island in the archipelago. With G Adventures, exploring the landscape, culture, and wildlife is planned perfectly on land or sea.